In 2016 an entire class of cards was printed, largely ignored and overlooked, and swept through and utterly infiltrated Vintage, in a testament to the challenges in the science of prediction and forecasting any format. The Eldrazi entered the Vintage plane and took over in 2016, and helping creature new taxing strategies, including one of the most unprecedented ever conceived, an optimally unpowered upper tier competitive strategy – the holy grail of Vintage budget play. 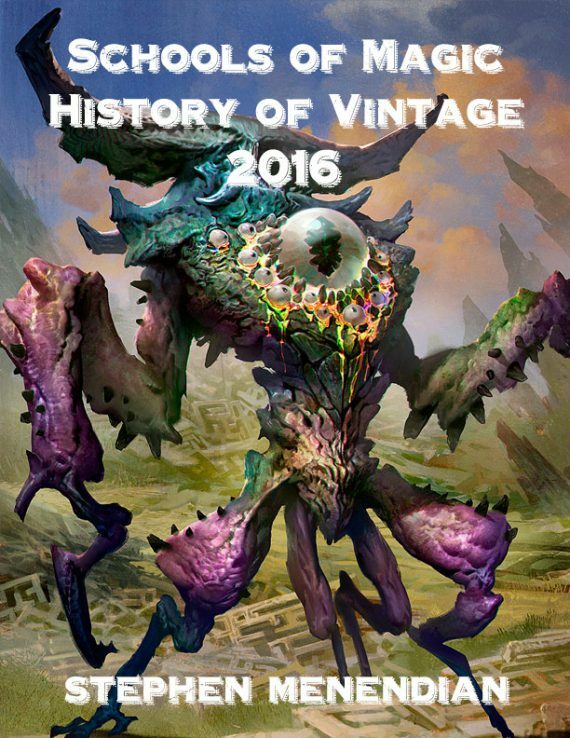 Read about the Eldrazi Empire, the restriction of Lodestone Golem, and the heated debates about Gush in the 2016 chapter of the History of Vintage. We continue to see an imbalanced metagame. In particular, Mishra’s Workshop–based decks continue to be significantly overrepresented, reducing the competitive metagame. While this issue could be solved by restricting the namesake card, if possible we would like to keep the deck at a competitive level, but played to an extent that the format is more diverse overall. Lodestone Golem leads to some of the less-interactive games. We are hopeful that limiting Workshop decks to one copy of the card leaves the deck at an appropriate strength. For that reason, Lodestone Golem is restricted. Lodestone Golem fused the taxing power of Sphere effects with the tempo power of Juggernaut, forming a truly monstrous O’Brien School appendage. Several times, Lodestone filled Vintage Championships with Workshop decks in the Top 8, but in each case failed to achieve victory. It is not unlikely that had Lodestone done that in 2012 or some other year, it would have been restricted not long after. But having avoided the hangman’s noose so many times, Lodestone’s restriction nonetheless sent a shockwave through the Vintage community. On the other hand, some players felt that the restriction of Golem was fundamentally unfair because of the perceived role that VSL competitors played, a perception that preexisted this event, but was aggravated by it. Jason Jaco’s article, published just days before the restriction, was an impassioned defense of Workshops and Lodestone Golem, pleading for a “status quo” decision. In particular, he argued that neither the data nor the available evidence supported a decision to restrict, such that it would justifiably deflect criticism. Moreover, Jaco felt that the holistic balance of the format at the time was not only sufficiently self-policing, but that the “necessity of diversity of strategy” was first and foremost what would require patience, and a far longer view of the metagame and historical trends. While Brian concluded that “Lodestone Golem needed to be restricted in Vintage,” and that “It was the card that changed Workshops from being very good in Vintage to being oppressive for an extended period of time,” he agreed with my assessment at the time that that he would have preferred a format “with only Lodestone Golem restricted (and not Chalice) to see if that ultimately created a better Vintage format.” But the title of Brian’s article, “Who Killed Lodestone Golem?” squarely placed the blame on VSL competitors, perhaps somewhat unfairly, in understanding why Golem was restricted. I think the underlying data also played a role, but Brian’s assessment inflamed Vintage passions. For my part, I opined on our podcast and otherwise, that the DCI was justified its decision, even though I would have handled the situation differently. A subtle position, I defended the DCI’s decision as reasonable based upon the totality of evidence, even though I felt it was a borderline case. But perhaps the most prescient and hopeful voice, and one that received the least immediate attention, was erstwhile contract columnist Paul Mastriano. In an article with the colorful title “Don’t Cry for Me, Lodestone Golem,” Paul sketched out possibilities for Workshop players in a post-Golem world, concluding that Thought-Knot Seer seemed like a promising replacement for those slots, and would not be vulnerable to artifact removal either.